There was an incredible amount of action spread throughout the halls of the Rio on Day 10 of the World Series of Poker. Two bracelets were won, including the conclusion of the 2018 $565 Colossus. Big names players registered for the $10K Dealer’s Choice which got underway and the final four of the $10K Heads-Up tournament is set. There’s plenty of results, chip counts and everything you need to know from Thursday (June 7) at the WSOP. 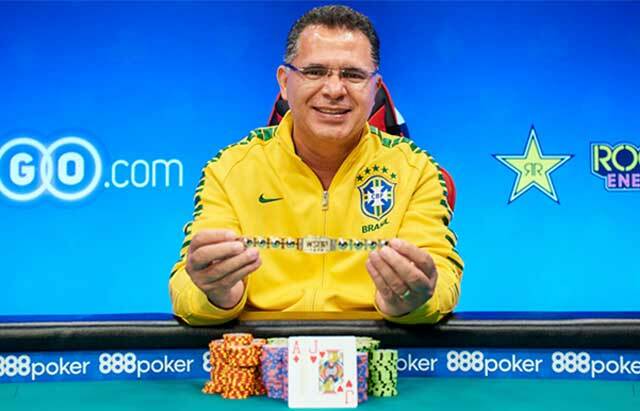 Brazil’s Roberly Felicio is this year’s winner of the mammoth $565 Colossus. He outlasted the 13,070 player field to take home his first gold bracelet and the $1,000,000 guaranteed first place prize. “I’m very happy, it was a tough final table with tough opponents. Headship was very emotional. But I’m excited to take home my first bracelet, I still can’t believe it,” Felicio said. Felicio’s heads-up opponent, Sang Liu, takes home half a million for his runner-up finish. Felicio held court with a rail of notable Brazilian pros who cheered him on to the finish. Felipe Ramos, Bruno Politano, and Andre Akkari were all spotted willing Felicio to the win. It was a quick conclusion to Event #14: $1,500 No-Limit 2-7 Lowball Draw. With only three players left in the field, the final table resumed with chip leader Daniel Ospina holding a significant lead over Timothy McDermott and Shaun Deeb. According to WSOP.com, Deeb was out in third within thirty minutes, putting to an end his bid to win two bracelets on the same day. Deeb collected $36,330 for his third-place finish and hustled across the hall to take his Day 3 seat in Event #13. It didn’t take long after that for Ospina, with his now massive chip lead, to dispatch of McDermott, giving the Colombian his first gold bracelet. McDermott earned $54,180 for his runner-up finish, only outdone by the $87,678 first place prize collected by Ospina. Ospina, who finished as the runner-up in this same event back in 2015, remarked that this part of his poker journey has come full circle. Not only was this Ospina’s first bracelet, it’s a first for Colombia. Originally anticipated as a three-day event, Event #13: $1,500 Big Blind Antes NLHE will reconvene for a day four. Benjamin Moon will be the chip leader when the remaining six players take their seat to finish off the tournament and determine who will take home the $315,346 first-place prize and some new hardware. Day three started with 30 players left, all of which were already well into the money. Some big names that were still in the hunt, that failed to survive the day. Daniel Strelitz ($7,670), Ankush Mandavia ($7,670), Dylan Linde ($9,350), Justin Young ($9,350) and Shaun Deeb ($11,553), who was playing two Day 3’s at the same time, all hit the payout cage. From the unofficial final table of 10 players, only four would fall, including one-time chip leader Dutch Boyd ($23,605) before they called it a night. Players return at 1 pm PT to play down to a winner. He held the overnight chip lead from Day 1 and he never let go. Damjan Radanov is still the chip leader after the 217 players who returned for Day 2 in Event #15: $1,500 H.O.R.S.E. was whittled down to just 24. Along with Radanov, there are a few big-time pros still vying for the over $200,000 first-place prize. Brian Hastings, Matt Woodward, Andrey Zhigalov and Scott Clements will all return with chips on Day 3. Sixteen players started the day, but now only four remain. All eyes are going to be on the 2018 Super High Roller Bowl Champion Justin Bonomo to see if he can extend the legendary heater he’s been enjoying this year. Bonomo will face off against Martijn Gerrits in the first semi-final match at 12:00 noon PT. The second will feature Spain’s Juan Pardo Dominquez taking on Jason McConnon from Manchester, England, getting underway at 1:30 pm PT. Once these matches have been completed the final two players will battle it out for the first place prize of just over $185,000 and the gold bracelet. Bonomo went through both Niall Farrell and Mark McGovern to get to the semis, while Gerrits defeated Kane Kalas and Jan-Eric Schwippert. On the other end of the bracket, Dominquez bested both Jason Mo and Nicolai Morris in order to face McConnon who survived bouts with Galen Hall and Kahle Burns. Day 1 of Event #17: $1,500 NLHE 6-Handed saw 1,663 players register for the event with only 264 surviving the day. The money bubble will burst early on Day 2 as 250 will make the money in this one. Plenty of big-name players navigated the day and bagged up for the night. Matt Berkey, Kevin Saul, Sam Stein, Amnon Filippi, Jared Hamby, Jeff Madsen, Josh Arieh, Brent Hanks, Nick Schulman, Barry Greenstein, Justin Young, Joe Serock, Hugo Perez, Shannon Shorr, Adrian Mateos and WSOP Main Event Champion Martin Jacobson are just some of the faces that will be gunning for the $378,743 first place prize. Every discipline is on the table for the big buy-in Event #18: $10,000 Dealer Choice 6-Handed. 103 players registered for the event that allows top-tier professionals to choose their best game and force everyone to play it. At the end of the day only 41 remained with Bryce Yockey in the overnight chip lead. Players who made Day 2 is a who’s who of the poker world. A sample of who is left in the field includes Calvin Anderson, Ben Yu, Anthony Zinno, Gavin Smith, James Obst, David Bach, Daniel Negreanu, David Benjamin, Mike Matusow and Adam Friedman. Registration for this event remains open until the first hand of Day 2 is dealt 2 pm PT on Friday. Friday is going to be busy in the halls of the Rio as players flock to participate in four different tournament flights. Event #19: $565 Pot-Limit Omaha, an unlimited re-entry tournament, has two starting flights. One at 10:00 am PT and another at 5:00 pm PT. Event #20: Big Blind Antes $5,000 NLHE has a mid-afternoon start and due to the price point, should see a ton of big names registering. Finally, the second flight of Event #6(B): GIANT – $365 NLHE will see people working late into the night to make the money or find a bag.